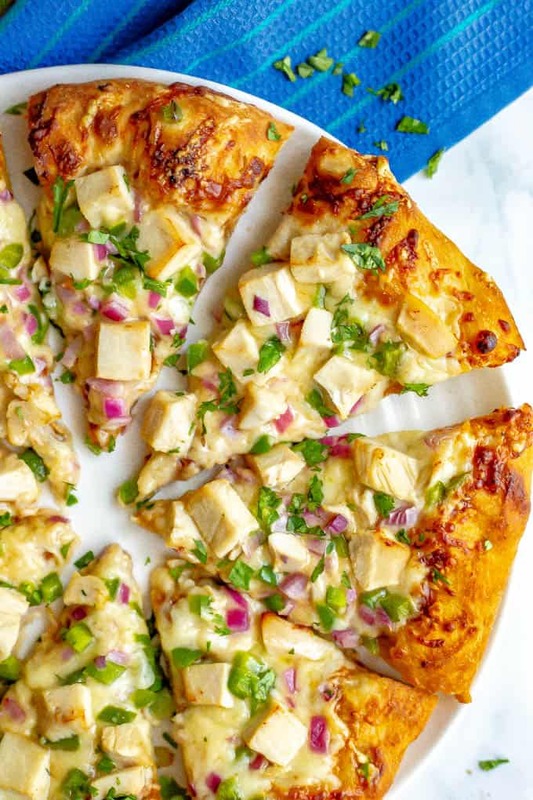 Easy BBQ chicken pizza comes together so quickly with just a few store-bought ingredients and is packed with tons of flavor! 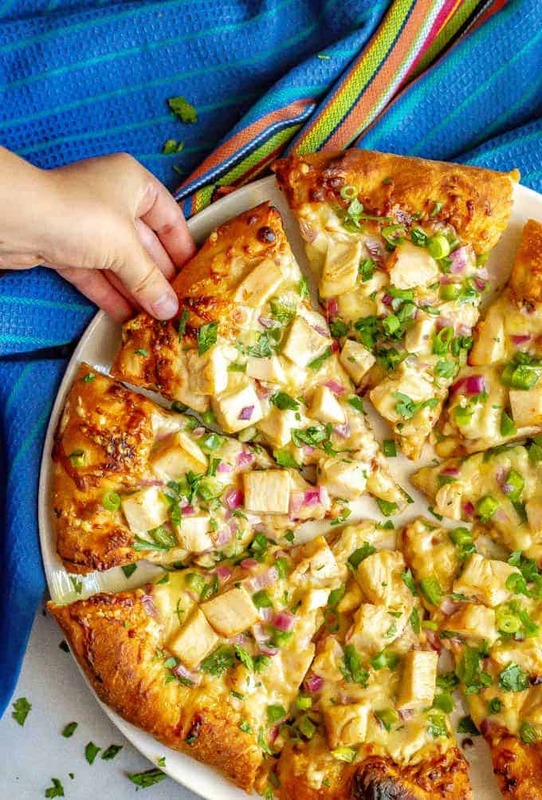 It’s perfect for a different twist on pizza night! The kids are finally back in school after being out for a few days due to Hurricane Florence. We were lucky to have never lost power, which the kids were actually bummed about. Apparently I talked up flashlight tag a little too much. 😂And while we definitely got a little stir crazy over the long weekend, we are thankful to all be safe. My thoughts are with those near the coast who had it much rougher than we did. 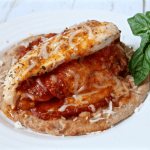 Today’s recipe for easy BBQ chicken pizza is from my friend Tiffany’s new cookbook, The Ultimate Kids Cookbook. She’s a fellow food blogger at Peanut Blossom — and also lives here in Charlotte! — and this cookbook is such a cool idea. 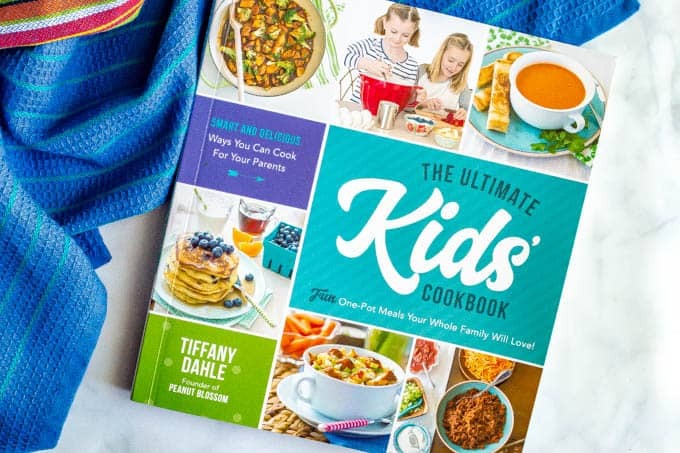 She’s written the recipes, along with her two daughters, so that kids can follow each recipe to cook a meal for their family. She has one-pagers throughout the book to give kids some basic fundamental skills, such as how to scramble eggs, how to cook ground beef, etc. Then she includes directions on each recipe for what the kids can do, what they need to ask their parents for help with, and a “teamwork” section of working together. My 7-year-old daughter M is so excited to get her hands on this book! She’s been dying to help me more in the kitchen and this is the perfect resource for us. I’m hoping that as we work through a few recipes together a couple of times, she’ll be able to take the lead soon. Talk about a major confidence booster! And this easy BBQ chicken pizza recipe was a no brainer first pick for us because pizza is M’s favorite food! She normally goes for the standard pizza with marinara, but she loves BBQ sauce, so I thought this would be the perfect way to explore another pizza variety. And I knew she’d have fun rolling out the dough with her fingers. She’s in a super messy phase right now. She loves playing with soap and water and shaving cream and glue and dirt… and getting her hands into something like dough is just up her alley. Plus, who doesn’t love slathering on some sauce and covering a pizza in not one but TWO cheeses?! We were all anxiously waiting for this pizza to finish cooking — and for me to take some super quick photos — so we could dive in! I used store-bought whole wheat pizza dough but regular white dough or homemade would be fine here too. The cookbook includes a recipe for homemade pizza dough as well. I used store-bought BBQ sauce, but homemade would be great too. 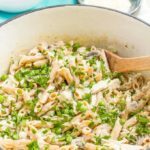 Pick up a rotisserie chicken to make this a super quick recipe. 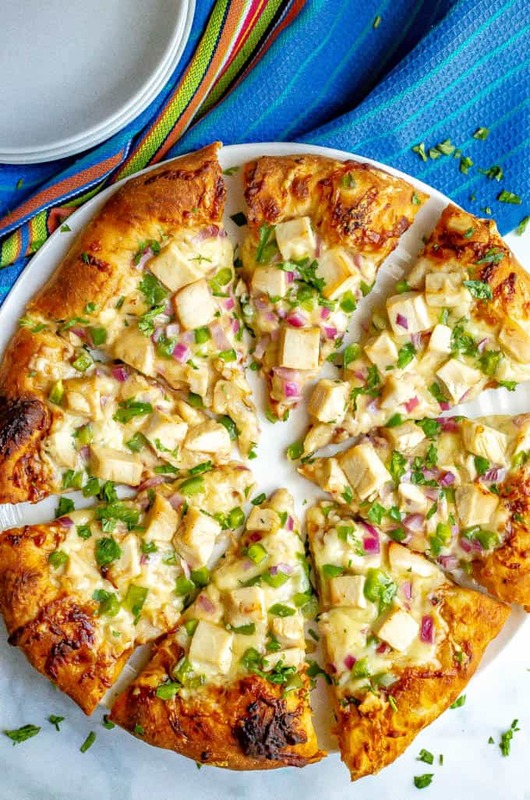 Or you could boil, roast or grill a chicken breast to use for this pizza if you prefer. You can put the peppers and onion on just half of the pizza if someone doesn’t want either of those. If you really love BBQ sauce, you could also toss the chopped chicken in some BBQ sauce before adding it to the pizza. 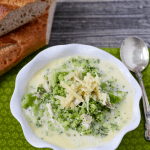 As per the notes in the cookbook, kids can help roll out the dough, chop the veggies in a food processor, spread the sauce, and add the cheese and all of the toppings. M and I plan to have many more cooking “dates” in the kitchen! 💕And this cookbook will be a big help for both of us. 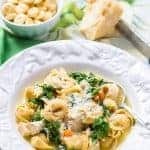 I hope you’ll check it out and get in the kitchen with your kids! P.S. 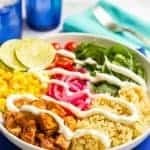 Check out all of my chicken recipes in under 30 minutes for more fun family dinner ideas, like my skillet salsa chicken, easy mozzarella baked chicken and healthy chicken Alfredo with broccoli. 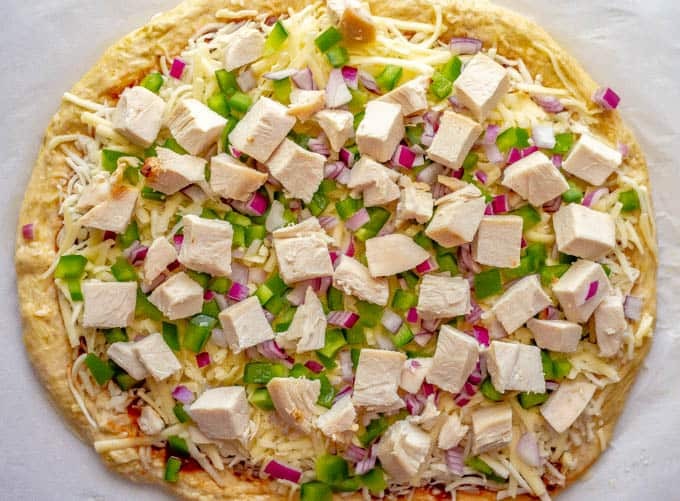 Easy BBQ chicken pizza comes together so easily with just a few store-bought ingredients and has tons of flavor! Place a pizza stone on the middle rack of the oven and preheat the oven to 500 for 25-30 minutes. Place a large piece of parchment paper on your rolling surface and sprinkle it with some cornmeal. Sprinkle some flour on your hands and place the dough on the prepared surface. Use your hands to gently shape the dough into a large round pizza circle, adding more flour if necessary to keep it from sticking. Then dough should be pretty even all around, but you can leave some extra dough on the edges for a crust. Brush the outer edge of the pizza with some olive oil. Add the BBQ sauce to the center of the pizza and use a spoon to evenly spread it across, leaving a little bit of room at the edge for the crust. Sprinkle the mozzarella and cheddar cheese evenly over the BBQ sauce then add the pepper, onion and chicken. Carefully transfer the pizza on the parchment paper to the preheated pizza stone. Bake at 500 for 8-12 minutes, depending on the thickness of your crust. The pizza is ready when the cheese is melted and the crust is golden brown. Carefully slide the pizza and parchment paper onto a cutting board and slice the pizza. 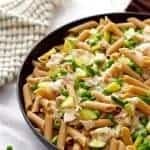 Sprinkle with chopped fresh cilantro and serve! I used store-bought whole wheat pizza dough but regular white dough or homemade would be fine here too. If you really love BBQ sauce, you could also toss the chopped chicken in some BBQ sauce before adding them to the pizza. 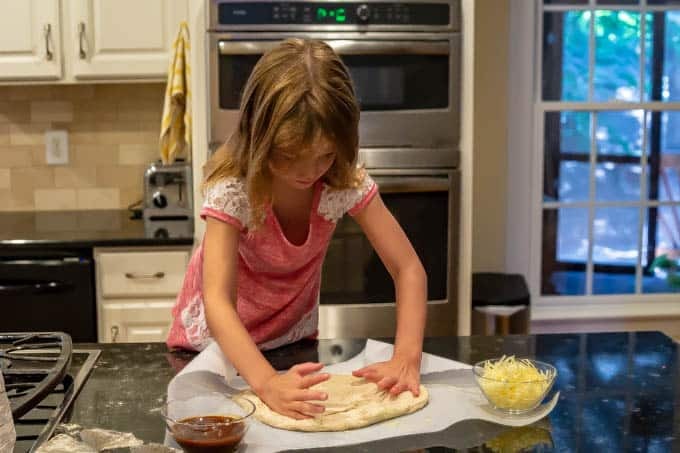 Kids can help with rolling out the dough, chopping the veggies in a food processor, then spreading the sauce and adding the cheese and all of the toppings. I love it so much when my kids help with preparing meals! Pizza is such as easy way to do it too 🙂 We do individual pizza nights and this will be another flavor combo to add! It’s so fun, isn’t it?! I’m excited to help them learn new kitchen skills so they can do even more with me in the kitchen. I hope you love this pizza!